The Unit Award, which can be earned by Cub Scout Packs, Scout Troops, Venturing Crews, and Sea Scout Ships. The Unit Award is a Certificate awarded on the Council Level. The Hornaday Badge, which can be earned by Boy Scouts, Sea Scouts, and Venturers and is also administered on the Council Level. The Hornaday Gold Badge, which can be awarded to adult Scouters who have given significant leadership to conservation at a council or district level, and is also administered on the Council Level. The Bronze and Silver Medals, which can be earned by Scouts, Sea Scouts, and Venturers and are administered Nationally. For details of the Hornaday Award program, click here. For a history of the Hornaday award program, click here. The successful attainment of the youth awards will normally take at least 18 months to accomplish. For the adult awards, the Gold Badge and Gold Certificate require 3 years of service, and the Gold Medal, at least 20 years. The following are highlights of the requirements for the Youth awards (Badge, Bronze Medal, and Silver Medal). These awards are presented for distinguished service in natural resource conservation for units, Scouts, Venturers, Sea Scouts, and Scouters. Scouts may earn the Hornaday Badge or the Hornaday Bronze or Silver Medal. Complete the requirements for any three of the merit badges listed in bold. In addition, complete any two of the others listed. For the bronze medal: Plan, lead, and carry out at least three projects from three separate categories listed. Earn the Environmental Science merit badge, plus at least three additional badges shown in boldface, and any two others listed. For the silver medal: Plan, lead, and carry out at least four projects from four separate categories listed. Earn all six merit badges listed in boldface, plus any three others listed. 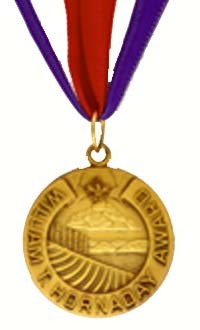 The complete program of the applicant, as planned and carried out, will be reviewed and approved by the council for the award of the certificate or badge or both and, further, if deemed qualified, will be recommended to the William T. Hornaday Awards Committee for consideration for the Silver or Bronze medals. Each project should be equivalent in scope to an Eagle Scout leadership service project. A project planned and carried out as an Eagle Project, which would normally qualify for Hornaday Awards MAY BE USED as one of the Hornaday Projects. One of the other projects can be performed on BSA property.